A pristine and serene land known for its profound Bhutanese hospitality, generosity, kindness and unique architecture, Bhutan only opened up to television and to the internet in 1999. Most Bhutanese speak four languages, including English, and so there is an ease, visiting and conversing with the locals, in markets, monasteries, and in the villages. Their Gross National Happiness (GNH) concept and initiatives, launched forty years ago, which is now being pollinated and embraced in the world: it is the filter through which the Bhutanese assess all development projects and opportunities. The Bhutanese have rejected offers from the Chinese and Japanese, for tens of millions of dollars, to open mountaineering to their highest peaks. No amount of dollars or gold can change this society’s commitment to honor the sacredness of the Bhutanese Himalaya. Climbers are simply not allowed to climb peaks where the deities have lived for eons. 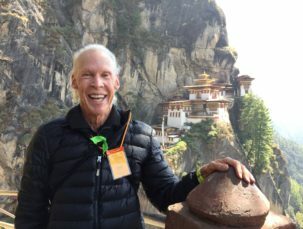 Bhutan’s very special and gentle “secular Buddhism” and approach to compassion and mindfulness, which has vast wisdom and secular applications for us Westerners, in finding The Middle Way. At the same time, Tibetan Buddhism is well preserved in Bhutan, has great strength and is practiced in all its full, rich complexity, and is available in an auspicious way, to all curious pilgrims and travelers to the Kingdom. A rare “conversation” dialogue between Western teachers and highly respected English-speaking Bhutanese lamas, monks, and scholars. Western Teachers will be participating fully throughout the Pilgrimage and the Retreat. The October 2019 Bhutan Pilgrimage and Retreat will offer meditations, mindfulness movement experiences, teachings, dialogue, and group processing activities. The retreat will include accessible meditation teachings, Dharma talks and practice, and ceremonial practices indigenous to the kingdom of Bhutan. 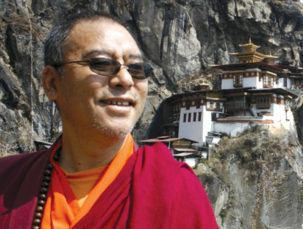 Social compassion in Bhutan’s spiritual ecology of Gross National Happiness. Bringing compassion and Wise Action back home to heal our global community and ecology. Applying the retreat lessons in all our relationships. James Ishmael Ford has walked the spiritual path for more than fifty years. He’s danced with Sufis, studied with Gnostics, lived in a Buddhist monastery and was ordained a Zen priest. Later he also ordained as a Unitarian Universalist minister and preached from the high pulpits in old New England churches. 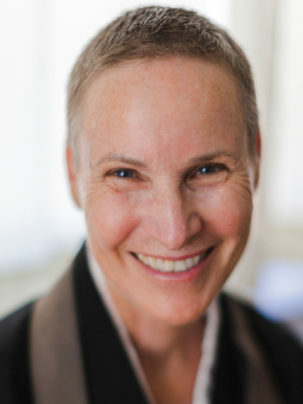 The Abbot of Houston Zen Center, Setsuan Gaelyn Godwin, is connected nationally and internationally with Buddhist teachers and organizations, and, in addition to her own travels to lead Zen retreats, she brings nationally recognized teachers to Houston for Dharma teaching. 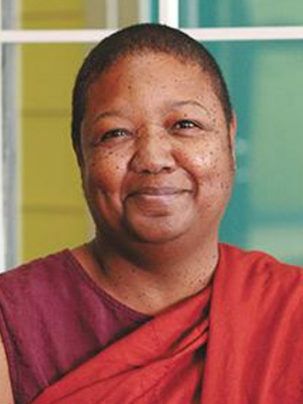 She received ordination as a Zen Priest in 1991, from Tenshin Reb Anderson, Senior Dharma Teacher at San Francisco Zen Center. She received Dharma Transmission, also from Tenshin Reb Anderson, in 2003, and was appointed Kaikyoshi (formal recognition from Japan) in 2005. Her Zen lineage is Soto Zen, through Dōgen Zenji, and, ultimately, through Suzuki Shunryu Daiosho, founder of San Francisco Zen Center. 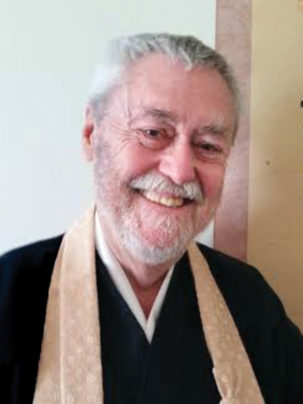 “I first encountered the Dharma in 1974 in attending a seminar with Chogyam Trungpa on “Cutting Through Spiritual Materialism.” At the time I was an ordained Presbyterian minister but actually “pretending” which is what spiritual materialism is. The sitting practice has become my life’s blood. 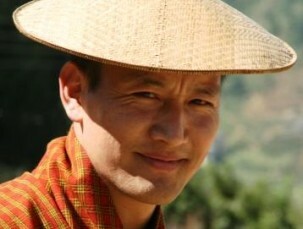 “I became a student of Dilgo Khyentse in 2000. It is said that when a great teacher passes away, his mind becomes more accessible. 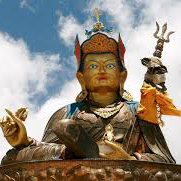 What I’ve discovered in his teachings, especially teaching Vajrayana from the perspective of Mantrayana, which has a powerful simplicity in the cultivation of compassion. “The opportunity to do a retreat in Khyentse Rinpoche’s Monastery is what inspired me in 2018 to the journey to Bhutan and return this year to teach. The experience was profound. “Personally, I’m a Contemplative Psychotherapist for the past forty-nine years, married for that long, have four adult children and eight grandchildren. Please view their information in the Teachers’ page link. Among sacred sites during retreat week, we will visit Cheri Monastery, also called Chagri Dorjenden Monastery, established 1620, established by Ngawang Namgyal, founder of the Bhutanese state. Cheri Monastery is home to many sacred relics, located north of Thimphu. Cheri is a meditation center for higher level Buddhist studies, accessible by a gentle hike through the forest. A visit to Cheri is spiritually purifying. Many young reincarnated masters study here. 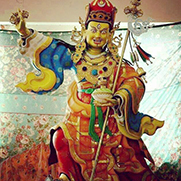 The Cheri Monastery site was visited by Guru Rinpoche, the precious saint of Bhutan, who introduced Buddhism into Bhutan, and who is also called Padmasambhava, in the 8th Century. 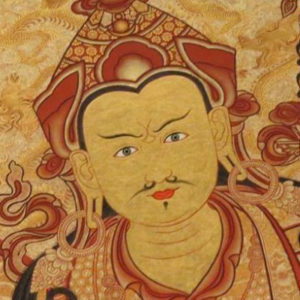 He flew into Bhutan on the back of a tigress, his consort. There will be deepening conversations about bringing compassion, altruism and resilience into your professional and personal practice. How Much does it cost? The 14-day Tour costs $4,350.00 per person, with double occupancy. For individuals traveling alone, who might prefer double occupancy, we will endeavor to find you a roommate. The 6-Day Retreat fee is an additional $795.00 registration, which covers seven teachers’ honorariums, their travel cost, their in-country Daily Tariff of $250.00 a day, rental of the Monastery Prayer Hall for the week, and contributions to benefiting charities. Pricing is driven by the official Bhutan daily visitor Tariff of $250.00 a day, part of which pays for universal healthcare and universal education for Bhutanese citizens. The Daily Tourist Tariff is included in the $4,350.00 Most of the rest of the $4,350.00 goes to the Bhutan travel company, Bhutan Wisdom Tours, for their operating costs and guides, hotels, micro-bus rentals, and meals. This is all-inclusive, and includes all meals and lodging, government tax, and English speaking Bhutanese guides. 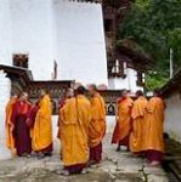 The tour package price also includes all in-country ground transportation, airport transfers, fees to our Bhutanese tour-travel company, all presentations, museum and temple entry fees, honorariums for the seven presenters, lamas, monks, and scholars; and donations to the host monastery and to local nunneries and monasteries. Danna and Tipping. Danna, or making a contribution from the heart, to the teachers at the end of the retreat, is an expression of generosity. Your gratitude for their teachings can manifest in however much you wish to donate. Separately, on the last evening together at our Farewell Dinner, we will pass the hat or an envelope acknowledging the care and attention our tour guides and drivers devoted to us. Our participants ask what is customary. A guideline for a good experience, to express appreciation might be $5.00-10.00 a day per participant. This money will be given during the Farewell Dinner to the owner of Wisdom Tours, with whom we have worked since 2012, and we know of their integrity, to distribute these tips to their guides and drivers. Complete list of costs, inclusions and exclusions. Single occupancy add $795.00. For individuals traveling alone, who might prefer double occupancy, we will endeavor to find you a roommate. The price does not include $40.00 Bhutanese Visa, nor does it include airfare from the U.S. to Bangkok round-trip, nor does it include airfare from Bangkok to Paro, Bhutan, which is historically approximately $800.00 We will know the exact amount at the end of May, and this amount will be reflected in the final Invoice. Nor does it include travel insurance, which we highly recommend. We can send you links to reputable travel insurance companies. In 2018, Marla and Charles checked the travel insurance desired box at checkout, for purchasing our airfare. It was a total of $328.00 for the both of us, which was quite affordable for the coverage. Obtaining travel insurance when you purchase your international airline tickets might be the most effective and affordable coverage. You may also look into what travel insurance your credit card offers. We encourage you to use frequent flyer miles, if you have them, to Bangkok. Currently U.S.–Bangkok airfare is approximately $700.00 to $900.00 per person, and fluctuates, depending upon your departure city and also the time you purchase your ticket. The sooner you can purchase your airline ticket, the less you will be paying. There are additional “gateway cities,” in addition to Bangkok, and these include Singapore, Kathmandu, Nepal, and Kolkata, India. Please contact us if you plan to enter from a gateway city other than Bangkok. We encourage arriving early in Bangkok, preferably at least two days, to acclimate to the time zone changes and to ensure making the flight to Bhutan October 2nd, if you have unexpected travel delays in reaching Bangkok. Bangkok lodging. We prefer that our group stay at one of two Bangkok boutique family owned hotels that are 10 minutes from the International Airport. The hotels are The Orchid Resort at the International Airport (Please note there is a Sheraton Orchid but that is an hour away from the airport). The other is called Pongsakorn Boutique Resort. Both are approximately $37.00 per room night. Both are in the Lat Krabang district of Bangkok. We can provide a list of self-touring spectacular and memorable Bangkok destinations, if you come in extra early. Departure Bangkok for Bhutan: We plan to have all group participants fly Bangkok, Thailand to Paro, Bhutan, together, arriving in Paro Wednesday morning, October 2nd. Passports. Anyone considering this Tour must have a valid passport, and their passport needs to be valid for at least six months after date of return. Many international travelers choose to buy trip insurance, and we recommend doing so. This insurance, though very rarely needed or used, is for the possibility of trip interruption or a traveler becoming ill during a tour or Any hospital and medical expenses are the traveler’s responsibility. Bhutan Tourist Visa. The Bhutan Visa costs $40.00 and we will invoice you for this during your final Invoice. Your Bhutan Tourist Visa will be applied for after final trip payment has been received. We will need a color, high-resolution, scanned copy of your passport details information page containing your photo, and the adjacent signature Passport page, with your deposit, in order to start the Bhutan visa process. Payment Schedule. To reserve your place, a deposit of $1,500.00 is required, per person, Double Occupancy. For Single Occupancy, $1,900 deposit is required, to reserve your place. Checks are to be made out to Two Truths LLC, and mailed to: P.O. Box 70233, Tucson, Arizona, 85737. Payment by PayPal. Those who wish to pay by PayPal and possibly gain travel insurance and mileage points through their credit cards, please contact us. Paypal charges 3% for this service. *The way this works is once you indicate to us that you wish to make payment via PayPal with your credit card, we prepare the PayPal Invoice for you, and send it to you via your email address. It is that simple. Please note that we will be competing for limited Bhutan airline seat reservations, and limited hotel space, since October is a very popular travel season in the Kingdom of Bhutan. Please see our Detailed Itinerary . Deposits. We ask all deposits be made no later than July 15, 2019 in order for us to assure your space and to reserve and pre-pay the Bhutan airline seats and hotel rooms. In August and September there may or may not be space available, depending upon reservations. At the time of deposit we will need for you to also email a scan (hi-resolution) of your color Passport page (in color), with the adjacent signature page to us for Bhutan Visa application. We will send your passport scans to the Royal government of Bhutan, along with payment deposits. Final Payment. Final payment must be made by August 30, 2018. Final payment will be your balance due plus $40.00 for the Bhutanese Visa. Please note that the Tour-Retreat will have limited spots, due to Bhutan airline and hotel availability. We can guide you on the phone, as to your flight options into Bangkok, and assist matching up fellow travelers together where possible, leaving from their departure cities. Some tour participants wish to depart together, wherever possible. The Bhutanese air tickets (Druk Air and Bhutan Tashi Air) and travel documents/Bhutan visa will be issued 45 days prior to departure from the U.S.
We are requesting that the Bangkok–Bhutan airfare be paid by July 31st (in order to secure limited seats) in a check to: TwoTruths LLC. This will enable us to make one wire bank transfer to the Bank of Bhutan, to cover everyone’s Bangkok–Paro roundtrip airfares. 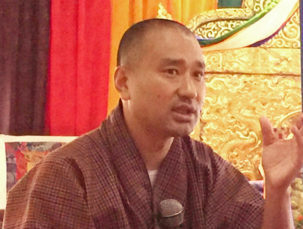 No one is allowed to board the flight from Bangkok–Paro, Bhutan without having a Bhutanese Visa, to be issued as a group boarding, to Two Truths. These are the Bhutanese Royal government’s rules to enter the Kingdom. We will be sending a second wire transfer of everyone’s hotel reservations to Bhutan over the summer. Return Flight Information. For your return planning purposes, as you shop for roundtrip flights to and from Bangkok, please note that for our return, we depart Paro, Bhutan Tuesday, October 15, 2019. Please do not schedule a flight onward that day, as we do not yet know the times flights arrive back in Bangkok. Typically, they arrive back by 4:30pm… some arrive back in Bangkok in the evening. We suggest you schedule your return flight for Wednesday, October 16th. Cambodia Post Trip: For those of you registering for the Cambodia–Angkor Wat Post Trip, we depart for Cambodia Wednesday morning, October 16th. (Cambodia. Tour limited to 16). We return from the Cambodia Post Trip, back to Bangkok, the evening of Wednesday, October 23rd. You can make your international return home reservations anytime beginning the morning of Thursday, October 24th. For any reason, tour payments will be 100% refundable with written notice, until July 31st, less $150.00 administrative fee per person. If written cancellation notice is received between August 1 and August 20th there will be a 50% refund and also a $150.00 per person administrative fee. Effective August 21st, payments are 100% non-refundable, as we are required to purchase your Bangkok–Paro air tickets as soon as your deposit is made, and these tickets are non-refundable. Deposits to hotels, and ground transport will already have been committed. Please note that airline seats and hotel rooms can be very limited in Bhutan in October. Clothing, Currency, and Special Needs. We recommend packing layered clothing, for comfort walking, touring, leisure time, and hiking. October day temperatures in western and central Bhutan ranges between 60–70 degrees, depending on location, and evenings from 50 to 60 degrees. Day temperatures in Bangkok can reach a humid 90 degrees and evenings, a balmy 75 degrees. We have an enchanting self-guided Bangkok destination activities list to share with you, for the days before the beginning of the Pilgrimage Tour. The 18-seater Toyota Cruisers are very comfortable, and have been a great option for those not wanting to walk or hike short distances, or to nearby destinations. We will be in various temperature zones in October, briefly passing through mountain passes and much of the time in valleys and high valleys. Bhutan typically has only four days in October with light brief showers. We are committed to a small group size travel experience and limit micro-bus occupancy to 15-16 tour participants. Because of the interest in the Retreat, more than 15 individuals will participate in this tour. Each micro-bus will travel autonomously and visit sacred places, markets, and restaurants independently. We will gather at the Retreat as a whole community creating sacred togetherness. Regarding Health and Traveling: We each have our own unique body and possible health challenges, and we encourage you to consult your healthcare provider and or your local international health travel office. Hepatitis. A vaccine is recommended by the Center for Disease Control (CDC) for most travelers including those with “standard itineraries and accommodations.” Hepatitis A is transmitted through contaminated food and water and via person-to-person contact. Typhoid vaccine is recommended for “adventurous eaters”… i.e. “street food,” although we do not recommend eating “street food.” Typhoid is transmitted through contaminated food and water. We recommend drinking only bottled water. Please bring a re-useable bottle/ container from home, for water, so we can refill in the mornings at hotel trustworthy water sources, reducing the utilization of plastic bottles (waste). Additional bottled water will be available on our touring vans, during the day. The estimated risk for malaria for American travelers in Thailand and Cambodia, is “low.” There is no risk of malaria in Bhutan. There is also no risk of malaria in Phnom Penh, and Angkor Wat, Cambodia. There are no mandatory health requirements: No immunizations for Yellow Fever, Dengue, Hepatitis, etc., are mandated for either Bangkok or Bhutan. We will be visiting Battambang, Cambodia, known for its heritage and sacred sites, where malaria exposure is possible. You may want to consider Atovaquone-Proguanil or Doxycyline. Again, consult your medical provider regarding applications and possible side effects. We will wear long sleeves and long pants and socks in the evening, and use mosquito repellent in Bangkok and Cambodia. If you believe you might have difficulty with elevations of 7,500 feet in Bhutan, you may want to research prophylaxis treatments for possible altitude sickness. Typically, we will be sleeping in lodges below 7,200 feet. We look forward to safe, healthy, and rewarding travels with you. Who Comes? Mostly, participants ‘self-select’, meaning our participants are ready to be immersed in a uniquely spiritual culture, and are open to awakening in the process of self discovery. They may be well traveled, and their nature is to embrace the unexpected. Local circumstances and delightful surprises may arise in Thailand, Bhutan, and Cambodia. From time to time, the printed itinerary may be slightly modified, depending upon locations and opportunities. Participants come for all kinds of reasons: Bhutan is on their bucket list; curiosity about the last intact Buddhist nation, and also the world’s youngest democracy. Or, a desire to hike in pristine old growth forests; or taste Bhutan’s expression of spiritual ecology; or a glimpse for beginning meditators; or “coming home” for long-time meditators and Buddhists. We endeavor to support each person’s aspiration in Bhutan, including separate itineraries or secular activities for spouses and partners. The Bhutanese currency is keyed to the Indian rupee, since India is their major trading partner. There are a few ATMs in-country and also Bhutanese currency can be bought at the Paro airport and re-sold back, also at the Paro airport, with no commissions or penalty. Numerous shops in Paro and also in the capital, Thimphu, accept credit cards. We are sensitive to individual physical abilities, regarding walking and hiking. As mentioned, travel will be in a comfortable temperature-controlled modern vans, and we pride our tours in accommodating individual needs for resting, walking, diet, and special needs. The 6-Day retreat will be held at 2,195 meters altitude, which is 7,200 feet. Please consult your physician about altitude issues. Travel itinerary does not include rigorous exercise. Any walking is leisurely, and at your own pace. We shall provide a detailed list and narrative, as well as an elaborate bibliography and recommended reading list of Bhutanese and Himalayan culture, Buddhism, archeology, arts, and Bhutan travel information, to each tour participant, upon receipt of their deposit. Wi-fi is prevalent and cell phones work surprisingly well in Bhutan. All hotels have Wi-Fi, although many only have connectivity in their lobbies. Many participants bring iPads and communicate back home via FaceTime. Some participants conduct business, as, for example, Bhutan is 13 hours ahead of Tucson, Arizona. See the Detailed Itinerary for specific days’ activities. Your days can be as filled, or as restful and contemplative, as you wish. We will be sending additional information in August, regarding what to expect with airline baggage allowances, electrical adapters for your devices, a list of hotels and contacts for your people at home, and shopping and cultural tips. Many thanks and please don’t hesitate with your questions: charles@ twoTruths.org or (520) 331-8338 in Tucson, Arizona.